When we came upon this Pique mi Madre sauce at the Fancy Foods Show in DC last month, it was as beautiful and flavorful as our good friend Buddah had described it. We were on the first floor of the show, Buddah had already toured the second floor and told us to be on the lookout for it. The herbs and peppers floating in the clear liquid were stunning. We sampled the sauce and were blown away with the rich flavor it had. Now THIS is a habanero pepper sauce I could love having on my table at all times. And NO REFRIGERATION NEEDED is a winner with me – my ‘fridge is already full. We’re talking “chunks” here people – chunks of garlic, chunks of habaneros, big pieces of oregano and whole black peppercorns were floating in a sea of vinegar with sugar and water added. 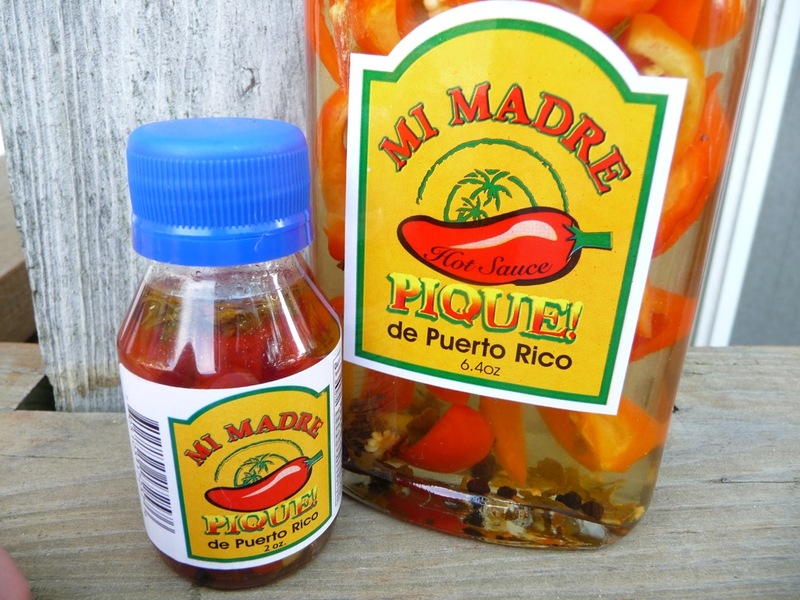 Mi Madre’s Pique de Puerto Rico truly is a flavorful and beautiful sauce, packaged nicely in a smart flask style bottle of 6.4 ounces. A simple list of ingredients defines the classic yet powerful flavor of this sauce. Warning: this sauce is remarkably thin! And in addition, the 2 oz bottle is a milder creature compared to the larger 6.4 oz flask bottle. The flask bottle does have a restrictor cap, the 2 oz bottle does not. This may be the only time you ever see me champion the restrictor cap on a hot sauce. It is so thin, you NEED the dropper cap in place to restrict the flow of liquid onto your food. And to further confuse things they apparently offer even bigger sizes of bottles at 12.5 ounces and a huge 25 ounce bottle! Texture & Appearance: – A very thin sauce containing bits and pieces or small chunks of garlic, habaneros, oregano and whole peppercorns. 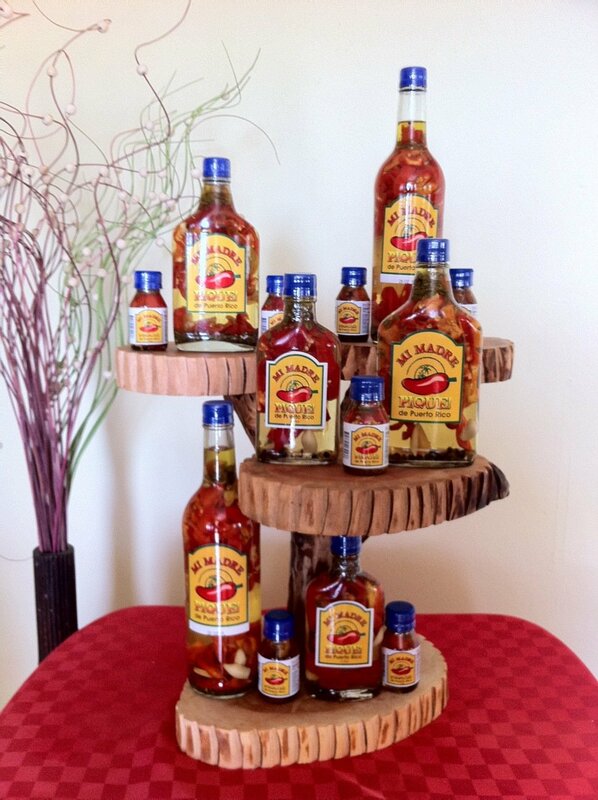 It’s truly a pretty sauce to behold. I do not like how thin it is, but the restrictor cap helps manage the flow of sauce from the flask. This gets a “5 star” on its beauty alone. Taste: – Warm, hot, spicy – with an almost “umami” taste up front. The aroma is deep and earthy – it has a “island” smell to it. This is a true “pepper sauce” with roots that go deeper than the “hot sauces” we Americans are used to – simple, yet complex. Heat Level: – Don’t let the beautiful appearance fool you. This “pepper sauce” packs some intense heat! The little 2 ounce bottle served up a series of sneezes on my part. The larger, and hotter, 6.4 ounce sauce caused me to get a big case of hiccups! Both sauces left a nice, peppery burn on my lips and tongue – front of the mouth. A bite of the habanero pepper from the bottle was very sweet, almost like a pickled sweet red pepper, but it *is* a habanero, and so the heat was just as intense as the sauce. Head sweats, hiccups, numb tongue – yea, it’s a 4.5 alright! Label/Graphics: – Extremely simple label. The red chile pepper on the bigger bottle has the words “Hot Sauce” while the smaller 2 ounce bottle does not. Overall Rating: – This is “liquid sunshine” – a fresh, bright, pungent pepper sauce that packs a big sting. Sprinkling a few drops on pizza was nice, but it’s not visually satisfying… you know the sauce is there, you just can’t see it. And it’s so thin, it runs off onto the plate. Seems wasteful, but maybe that’s why they offer the giant 25 ounce bottle! 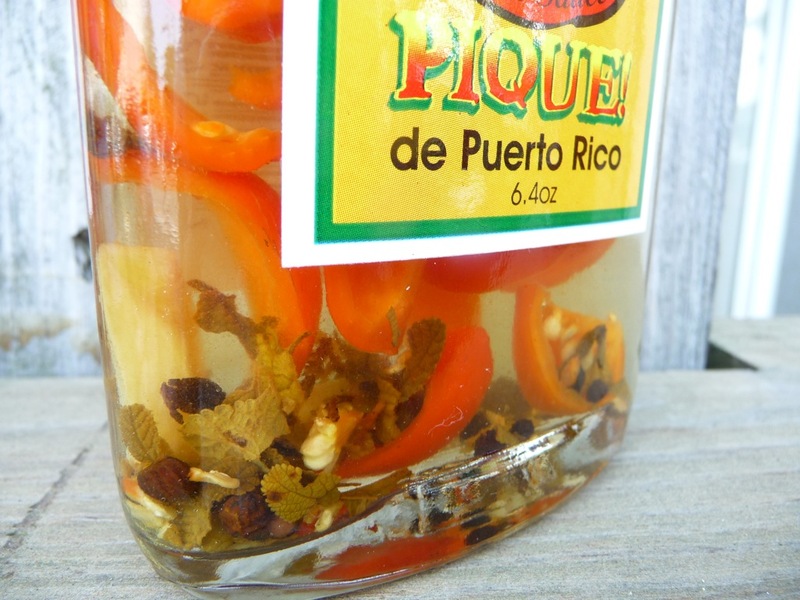 Pique mi Madre (Pique My Mother) is 100% hand crafted in the mountains in the center of the island of Puerto Rico. With over 10 years on the market, our product is distinguished by being 100% natural unlike other sauces on the market. Pique mi Madre does not contain any preservatives and is made ? ?with the best ingredients on the market including the habanero pepper, a chili world’s best grown here in Puerto Rico. The perfect balance of spicy flavor and spices make our product unique in its class giving it a unique flavor to your favorite dishes. Our product is designed to meet the strictest palate, with great pride that we present Pique mi Madre directly from Puerto Rico to the world. On behalf of Mi Madre Pique, Inc. we want to thank you for this outstanding review. We need reviews like this to keep improving our product. I wish you the best on your magazine and again thanks for taking the time to write this review. Excellent write up, Brian. The sauce looks simplistic, but amazingly beautiful from the photos you have. I will definitely put this sauce on my “to get” list. It’s pretty unique. I spent a lot of time putting this review together, as the sauce was so unlike any I’ve reviewed before. Thank you Ryan for the nice comment. Brian, being that is is a flavored vinegar (sorry if that’s too much of a generalization), what besides pizza would you suggest to try this on? I’m keeping it handy to find out what else it’s good on. Was a nice addition to my eggs this past Sunday morning. I’m liking it more and more. Gorgeous-looking sauce! Based on the ingredients and description, I think it would be good splashed on grilled or broiled fish and seafood as a marvelous way to add some spicy heat with a tropical flair. It reminds me of Southern pepper vinegars, which means it should also work quite nicely with a “mess of greens” as they say down here, such as collards or turnip greens cooked with ham or fatback. Another possibility is roast pork and pulled pork, since those are often seasoned at the table with a thin but piquant vinegar sauce, at least in eastern NC. Can’t wait to try some! Como puedo comprar el pique. I love this sauce, we brought it home when we were in Puerto Rico this year. I like it because it is a seasoned vinegar. I use it on beans and greens, potatoes etc. Then we use the peppers in things or just to eat!!! I counld see putting it in a blender or finely chopping some of it to a sauce and using it to. So versitility 5 stars. Thanks Skye. Great examples of uses for this sauce. 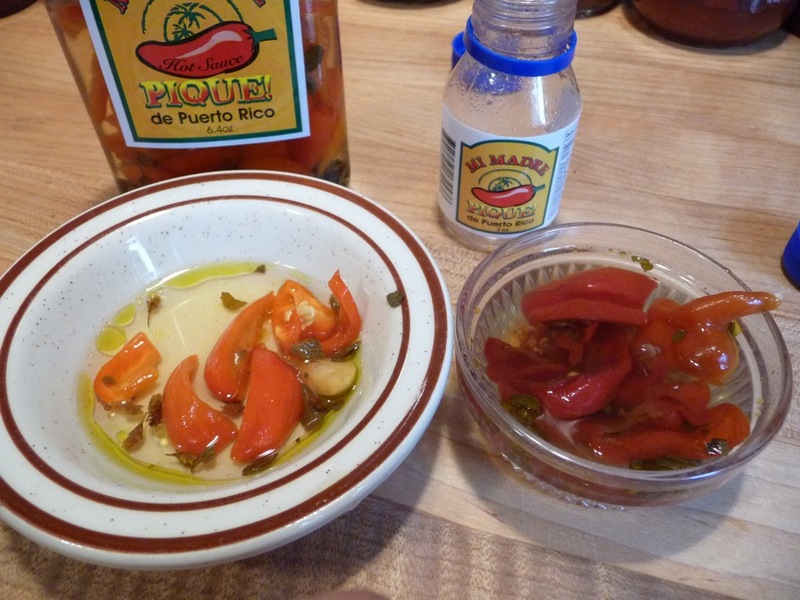 I have a tiny sample bottle I just may have to pluck the peppers out of, just to eat them. Your pique is good, but is not only one. As you know every puerto rican family has made it one way or another. My family has been making pique, we called it by the original name vinagre piqante. That is interesting to know, Jay. Thanks!